Some of you might be looking for high speed typing since you are planning to switch keyboard app, some others will look for keyboards with latest customization to kill the boredom of a typing job. Let us tell you what else should you consider simultaneously with speed and customization. 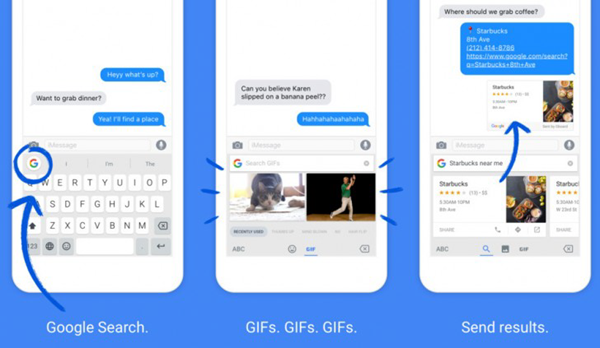 Keyboard is one app that you need alongside the operation of almost all the other apps: WhatsApp, Facebook, notepad, browser, and even in YouTube searches. This application, if associated with shady business, can easily keep track of your login credentials in any website and extract your credit card numbers when you use the keyboard for online transactions. How do you know what is the best keyboard app for Android that does not have such security threats? Simply look for the number of downloads and user reviews under the keyboard name in Google Play Store app. If the keyboard is old enough, with huge number of downloads and reviewed excellently, you can go for it. Still confused with the thousands of Keyboard options? Don’t worry. 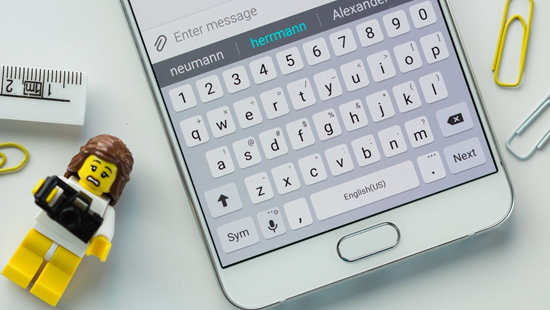 Check out our list of the best Android keyboard apps to improve the typing experience on your phone. Also, here are the best web browsers for Android that you might be interested in. If you are using Android, your phone might come with inbuilt Gboard. It is probably the best mobile keyboard app because Gboard doesn’t take up any extra space in your phone and you can completely trust it with all your private information. After all, it’s Google! All your devices with the same google account will be synchronized with your typing data in no time. You can even get contact names and email addresses as typing suggestions because Gboard is connected with every Google app in your phone. Moreover, Gboard gives you smart and accurate suggestions, thanks to Google’s machine learning technology. It has all the latest features and adaptations like customized gif making, choosing your own image for keyboard theme, one hand typing, swiping between keys, number key shortcut, switching between two languages, etc. GBoard supports huge numbers of global languages and hybrid tongues that lets you type fluently in your native language. 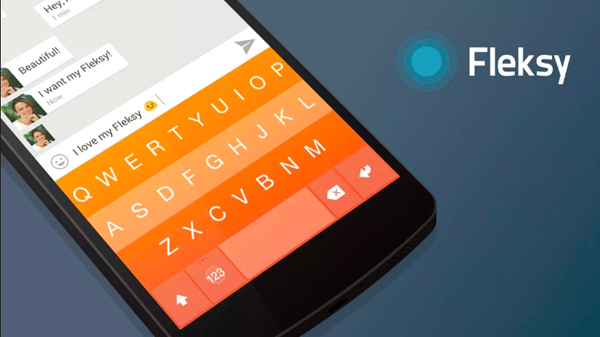 SwiftKey is Microsoft’s official Android keyboard. Since a decade it is fighting with Gboard neck to neck, and enjoyed the top position in the popularity bar for quite some time. Very recently, Google has finally been able to leave it behind with addition of vast number of new features. But the faithful SwiftKey users are still sticking to their old favourite, after all, who will leave the keyboard with multiple years of typing data! SwiftKey was the first keypad to come up with the most accurate swipe-typing, text corrections, next word predictions. It has its own cloud storage which can be used to store your own stock of words, acronyms that you use while typing. You can blindly trust SwiftKey when it comes to the protection of your private data. The app uses privacy policies that no third-party, not even the application itself can steal your important credentials. Although it is a large keyboard for Android that takes up lots of space and RAM, it’s worth a try if you don’t have storage crisis in your phone. If you are looking for an app that satisfies the overall need from a keyboard in general, SwiftKey will be your top option. This app has stolen the crown for being the fastest Android keyboard app several times. Also, this is the ultimate small keyboard for Android with a app size of 20 Mb only! No doubt it can function so fast without causing any disturbance in the overall activity of your mobile. 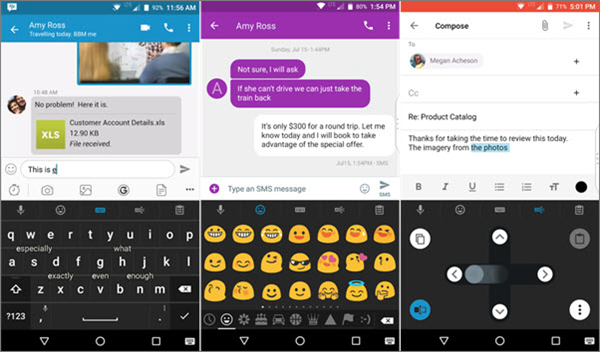 This keyboard bags the credit for most customizable keyboard for Android with more than a million customization options. It has a separate store for Touchpal keypad themes, colors, key pop-up options. Most of them are for free, but you can add some more themes to your list by spending some extra bucks. 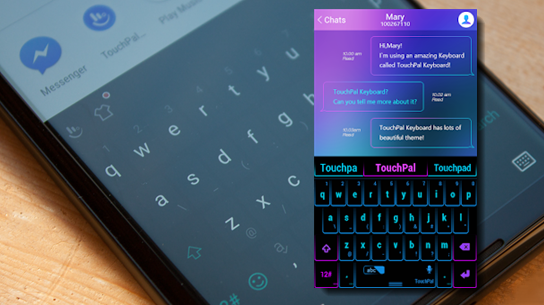 With Touchpal, you will never get tired of exploring new designs for your keyboard. It boasts of over 100 million downloads in Google Play Store. Recently it is launching a smaller version of the app in only 17MB variation that also supports artificial intelligence typing for accurate corrections and suggestions. Apart from these four, there are other deserving candidates who might qualify to this list for their particular niches. For example, Hydrogen Choorma keyboard is one such unique keyboard that supports automatic adaptation of different colors for different apps matching to the app background. Such as, red color for Quora and blue for Twitter, etc. Go keyboard is another potential name for the list which competes with SwiftKey and offers all the features the later one supports. Ai.type keyboard, Hacker’s keyboard are also niche-based examples that you might give a try. We have not placed these keyboard apps hierarchically because they have different traits. Someone who is looking for speed might not be satisfied with Touchpal, and one who is looking for interesting add-on might find Gboard too boring. Hence, we have just placed 4 of our favourite keyboards with their individual qualities. You are free to try them out and mark the one you like the most.